In this true story—a haunting saga of medical murder set in an era of steamships and gaslights—Gregg Olsen reveals one of the most unusual and disturbing criminal cases in American history. In 1911 two wealthy British heiresses, Claire and Dora Williamson, arrived at a sanitorium in the forests of the Pacific Northwest to undergo the revolutionary “fasting treatment” of Dr. Linda Burfield Hazzard. It was supposed to be a holiday for the two sisters, but within a month of arriving at what the locals called Starvation Heights, the women underwent brutal treatments and were emaciated shadows of their former selves. Claire and Dora were not the first victims of Linda Hazzard, a quack doctor of extraordinary evil and greed. But as their jewelry disappeared and forged bank drafts began transferring their wealth to Hazzard’s accounts, the sisters came to learn that Hazzard would stop at nothing short of murder to achieve her ambitions. The setting is a forested wilderness in the Northwest, circa 1911. The villain is a tall, egotistical woman doctor with an imposing jawline and a fierce will to dominate others. The victims are two wealthy English sisters, gullible health faddists after the fashion of those who flocked to Dr. Kellogg's sanitarium in Battle Creek, Michigan. But unlike Dr. Kellogg's comparatively gentle method of diet plus enemas, Dr. Hazzard's method was to literally starve her patients to death--and then defraud them of their valuables. Acclaimed true-crime writer Jack Olsen calls this book, "a literary and journalistic achievement of the highest order," and says, "Gregg Olsen reinforces his standing as one of America's greatest crime reporters, evoking the early twentieth century with a master's touch. 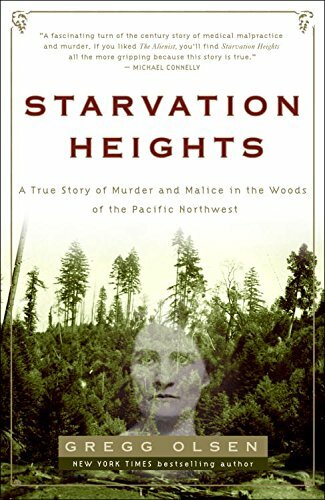 No reader will ever forget Dr. Linda Burfield Hazzard and her sadistic technique of mass murder by starvation."